1. Part NO: T26-3156-12R. (1) Emitting color: Super red. (2) Forward voltage unit (V): 13.2. (3) Totality luminous intensity unit (LM): 9.0. 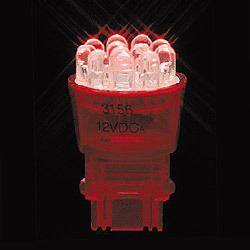 (4) Single LED axial intensity unit (mcd): 7500. (5) Dominant wavelength unit (nm): 630. (6) Viewing angle unit (deg): 19. (7) Color temperature unit (K˚): <=1500.